Nice place to stay if you need someplace to sleep. The bed and bathroom are good. There is no minibar at the room, so do not expect to buy water and left it in the mini refrigerator. The coffee is expensive and simple, it doesn't worth the price. Property is easy to locate but when checked in and entered the room there were no towels and the front desk staff had no clue when they'd be available. The hotel was full so they gave us an accessible room that had no clear instructions how to use the special shower. All attends super attentives and always gald to help. The highlight of the stay was Sanel (from Haiti) in the reception and the internet connection. Otherwise, the room was tiny and had a weird odor. The bathroom also had a strange odor. The room was not cleaned during my stay. Shampoo was not included. I wouldn't stay at an Ibis budget again. 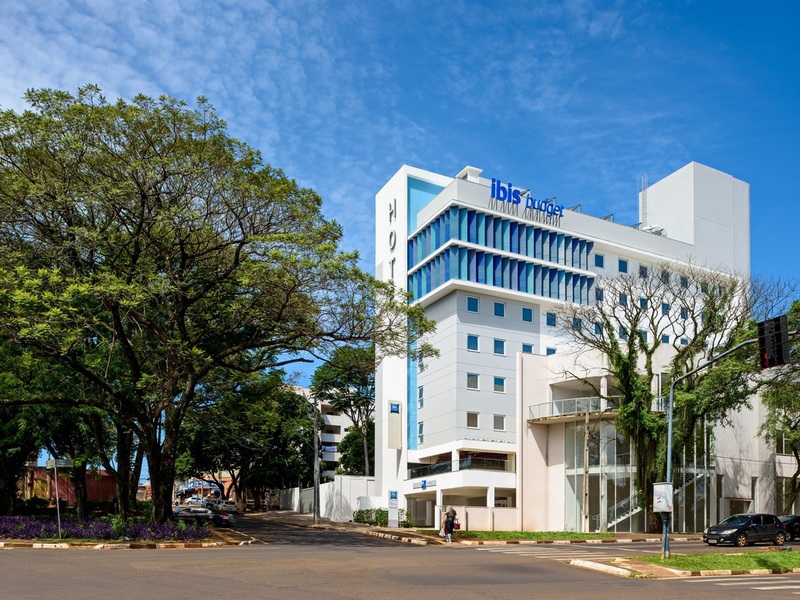 Dear guest, We appreciate your comments about ibis budget Foz do Iguaçu. Ibis hotels always wish to provide the best service, so your opinion is fundamental for us. Looking forward to welcoming you again, please accept our compliments. Sincerely, Fabio Bernardi. I always stay at Ibis Budget. It is near by Cataratas JL Mall and easy access to everything. When I rent a car, I can park the rented car there. Good reception people and nice breakfast too. We stayed for 3 nights. The hotel is extremely clean, convienient beds, very nice breakfast. Though, no clothes hangers. The staff (everybody, without exception) is extremely benevolent, always ready to help. Special thanks to Sannel. No problems with English. Highly recommend. Small but just what I needed. I accidently booked the Ibis Budget, not the Ibis (where the colleague I was travelling with stayed). My room was very small, but it was clean, comfortable and although it was right by the lifts, I wasn't disturbed at all. The décor was modern and cheerful - I liked the yellow wall. The shower was good. The desk staff were very helpful. The only irritating thing though was that returning to Rio, I looked at my reservation paperwork and saw that I should have had breakfast included for the rate I paid. When I checked-in at the hotel, I gave them my reservation number, but they didn't mention breakfast and as I'd already booked the wrong hotel, I assumed that I'd misunderstood and that it wasn't included. I therefore paid for 2 breakfasts at Rs18 each which should have been included. Dear guest, We appreciate your comments about ibis budget Foz do Iguaçu. Ibis hotels always wish to provide the best service, so your opinion is fundamental for us. Sorry for the inconvenience of breakfast, we refund the amount that was paid. Looking forward to welcoming you again, please accept our compliments. Sincerely, Fabio Bernardi. First time I stayed in such small triple room, but that was ok... but I really Missed, basics, like hand towel, shampoo nd cond., phone and a fridge.... I think the ham towel it’s really important. My daughter slept in top, 3rd bed.. and she complained that it was leaned down a bit and it was not a good feeling... so she tried to stay as close to the wall as possible. We arrived and had to make the third bed because it wasn’t made. The shower door didn’t close, there was a cockroach in the room. The stairs to the third bed were seriously dangerous and paInful to climb barefoot. Apart from that, no other problems. Prezada Karen Pereira M., Agradecemos a avaliação referente à sua estada no ibis budget Foz do Iguaçu. Na expectativa de lhe acolher novamente, queira aceitar os nossos melhores cumprimentos. Cordialmente, Fabio Bernardi. as the hotel is pretty new, the rooms, lobby etc. were all in a very good condition, clean and very modern. Problem here is the staff who needs training - procedure and language wise. Nearly no one there speaks English - we did the online checkIn to save time, at the hotel there was a counter for online checkIn but no one took care as they don't speak English - the only English speaking employee took care of the regular checkIn what leads to a 40min waiting time for us. The next morning they want to charge us for the breakfast although it was included in the rate and already paid for. I had to forward my confirmation email to them as a proof - this should have been within their system, no? Asking for something Glutenfree was a disaster as the didn't understand a single word. As Ibis belongs to Accor and this is a internationally operating chain, a bit of English is mandatory for every employee.